We are delighted to offer you a luxury three bedroom villa part of a vacation complex not far from Borovets. The development includes 3 detached chalets with a common swimming pool. 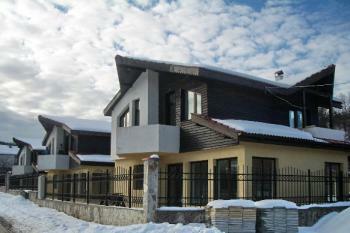 The complex is located in a beautiful and quiet village, about 12 km away from the best ski resort in Bulgaria - Borovets. The capital - Sofia and the International Sofia airport are just 65 km away and take less than an hour drive. Shuttle buses are available on regular basis to and from Borovets. There is only one villa left. It is sold fully furnished and is ready to be lived in or rented out. All chalets have modern architectural design combining traditional with contemporary. The villas are built up to all standards with highest quality materials. They are built with red bricks, insulation, red roof tiles, wooden elements and PVC double glazed windows. The villas come with electrical central heating installed. The first floor comprises of an open plan living area with kitchen. The lounge has a fireplace. There are three bedrooms and two bathrooms / WC. There is an electrical boiler for hot water. Each chalet will also include a sauna. Wireless internet, phone and cable TV will be installed as well. One of the benefits includes own fenced landscaped garden. Borovets is one of the oldest ski resorts in Bulgaria and offers excellent ski facilities with a season starting from November till March. The area is one of the most talked about after the announcement of Super Borovets project. This project will extend the tracks and will add a number of lifts, gondolas and hotels. This will definitely turn into a high class European ski resort for the years to come.